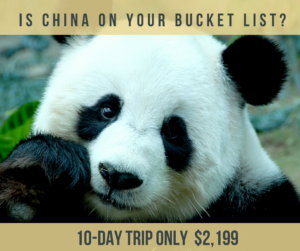 Travel to China with the Wilsonville Area Chamber! This is a Wilsonville Area Chamber of Commerce Sponsored Event and is OPEN to the PUBLIC! China Flyer5.15.18 WACC 2018 China Reservation Form! This all-inclusive, 10-day China adventure you will visit historic locations including Tiananmen Square, the Ming Tombs, and the Forbidden City. Learn about China’s extensive dynastic history while exploring the ultra-modern cities of Beijing, Shanghai, Suzhou, and Hangzhou. Spend time at the stunning Great Wall of China, walk along the Bund and bask in the natural beauty of Yu Garden. Thanks to our partners, we are able to offer this top-quality travel opportunity at an unbeatable price! When traveling with the Chamber, you will receive a first class experience starting right here at home. We handle all the arrangements, host a variety of informational meetings, introduce you to the other members of our travel group, and provide you with ample insight into your destination. A $300 non-returnable deposit is required to hold your reservation until departure. Deposit due June 1, 2018. Remaining balance and all paperwork due July 1, 2018.